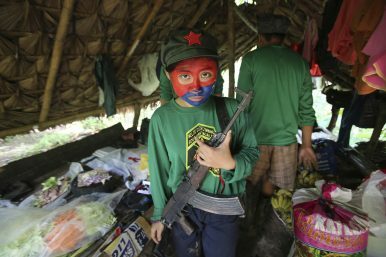 In this Nov. 23, 2016 photo, a woman New People's Army guerrilla with her face painted to conceal her identity holds her firearm inside a shelter at a rebel encampment tucked in the harsh wilderness of the Sierra Madre mountains, southeast of Manila, Philippines. The New People’s Army has defied multiple Philippine presidents’ efforts to eradicate its rebellion. Philippine communist guerrillas marked the 50th anniversary of their rural rebellion on Friday with threats of more attacks, possibly in cities, as a negotiated settlement remains elusive and peace talks have repeatedly stalled. The Maoist rebels have negotiated unsuccessfully with five Philippine presidents before current leader Rodrigo Duterte. The rebel force had only about 60 fighters, nine automatic rifles, and 26 single-shot rifles and pistols when it was established in 1969, and gradually grew and expanded across the impoverished nation. Battle setbacks, surrenders, and infighting, however, have weakened the guerrilla group, which is considered a terrorist organization by the United States and remains a major Philippine security threat. The communist rebellion has left about 40,000 combatants and civilians dead. It also has stunted economic development, especially in the countryside, where the military says about 3,500 insurgents are still active. Initially upbeat negotiations under Duterte, who calls himself a socialist, gradually unraveled as he protested continued insurgent attacks on government forces and the guerrillas accused troops of violating the government’s own ceasefire by continuing combat operations in what they said were their rural strongholds. Duterte and the rebels eventually lifted their ceasefires, sparking new violence. By Jim Gomez for The Associated Press.